If you want to drive real change, you’re going to have to get personal. It’s one of many lessons Randy McCleese has learned during his career, both as CIO at St. Claire Regional Medical Center, and as a member of CHIME’s Policy Steering Committee. Rather than just present Congressional leaders with facts and figures, McCleese describes the challenges that his and other rural organizations face in meeting complex regulatory requirements, and it’s made a difference. In this interview, he talks about the work his team has done during the past few years, and what they hope to accomplish in the future. McCleese also touches on the difficulties facing vendors, the value in partnering with outside organizations, and why CIOs need to be more strategic. Any updates, any reprogramming, any changes affect our workflow, as well as how the patient data it is inputted and then displayed. It may be minute in one area and great in another, but we’ve got to test those things and make sure that they work the way we need them to work. We don’t see a significant change in the efforts that we’re trying to do inasmuch as we’re trying to get electronic systems in place to better the care of patients and reduce the cost. That’s what we’re trying to do. Regardless of the political change, I don’t see the basic underlying effort changing. CIOs have to be more on the strategic end. I’m talking about how do we get out there and exchange data with other healthcare providers. The CIO is going to have to be out there on the front end of that, pointing out how we’re going to have to do that. Traditionally IT has been in the support role for the corporate strategies, but to me, IT has bubbled up to the top, to the point that it’s a strategic weapon. Because those organizations that do a better job of utilizing technology are the ones that, in healthcare, do a better job of taking care of the patient and do it more efficiently and more effectively. Gamble: And when you talked about some of the conversations that go on when you’re meeting with policymakers, is a lot of it telling them some of the experiences you’ve had, like with the system update that was supposed to be happening in November — just giving real-life examples of what you go through? McCleese: It has been, and those are the kinds of things that mean a lot to them. Because we’re dealing with, in some cases, specific patient experiences. In this case, this is a specific implementation experience. And yeah, that’s really what they want to hear — how difficult is it for us to do some of these things. Ultimately, I think we’ve all got the same train of thought; we want to do a better job of taking care of the patients. Gamble: Sure. And when you do speak to them, do you think sometimes they are surprised by what they hear? Because if you’re not the one who’s actually in using these information systems, I am sure it’s easy to be kind of removed from it. McCleese: Yeah. This is a little bit dated, but one of the things that we noticed was some of the folks did not realize that it takes anywhere near as long as it does to put a system in place and go through the testing process that we have to go through in order for it to do what it needs to do, before we can say that it’s live and we can put it in our day-to-day use environment. Because when we talked about it in Washington, I got the impression from some of the folks that they did not realize that you couldn’t just go put in the software and start using it on day one. And I don’t know of any health system that does that, because there’s a test period that goes along with it to make sure that it works the way it is supposed to work and it works the way we need it to work to take care of the patients. Because any updates, any reprogramming, any changes affect our workflow, as well as how the patient data it is inputted and then displayed. It may be minute in one area and great in another, but we’ve got to test those things that have been changed and make sure that they work the way we need them to work. I think that was one of the ‘a-ha’ moments we saw few years ago. Gamble: And as far as what’s coming up, obviously there’s going to be a period of change with whatever happens politically, but what do you think are going to be the biggest areas of focus in health IT policy in the near future? McCleese: We’re just sitting here with bated breath. We don’t what’s going to happen. I can’t speak for the others from the CHIME policy steering committee, but from my standpoint, we don’t see a significant change in the efforts that we’re trying to do inasmuch as we’re trying to get electronic systems in place to better the care of patients and hold the line or reduce the cost. That’s what we’re trying to do. Regardless of the political change — and there will be some change — I don’t see the basic underlying effort changing. I think it’s going to move forward, and to me, for the country, it has to. Gamble: At your own organization, St. Claire is part of the Kentucky Health Collaborative. Do you this is something that we might start to see become more common as far as some of organizations that are either smaller or in rural areas forming these partnerships to just help manage the challenges? McCleese: I do, and St. Claire traditionally has been not owned by, but a partner with other healthcare organizations. We’re into the fifth year of an accountable care organization that’s been a part of the Bon Secours Health System. And then the Kentucky Health Collaborative is relatively new — there’s a lot of discussion right now and I’m involved with that from the IT standpoint. But the IT group is coming up with suggestions and ideas on what we could do as a collaborative — not just from the purchasing standpoint, but also from the patient-care standpoint to provide the better flow of data amongst our collaborative members, because most of us have been somewhat partners in the past already. For example, University of Kentucky is a part of the Kentucky Health Collaborative, and St. Claire has been a teaching facility for University of Kentucky Health Care for 50 years. And with the collaborative coming on, it’s expanding the number of healthcare providers that we’re going to be working with. Within the collaborative itself, we’re trying to figure out some of the IT things that we can do to move forward. It’s still somewhat in its infancy; there are still some ideas being suggested, and we’re doing two or three of those ideas right now and vetting those on how far down the road can we go with them and how can it help us as a collaborative. But going back to you question, yes, I see that, especially when it comes to those of us that are out in the rural areas of the country. We’ve got to do some of those things in order to survive. Gamble: When it comes to being able to share data, that seems similar to what you said about actually getting in the EMR system up and running — that the idea of it is very different from actually being able to make that happen. And as we know, interoperability is one of the biggest challenges out there right now. McCleese: It is, and from the CHIME standpoint, one of the things we’ve dwelled on for quite some time are the two areas of interoperability. One is the identification of the patients themselves. CHIME has the patient matching challenge out there right now. That’s not as big of an issue for us here at St. Claire’s as it is in some of the larger markets where you have multiple people that have the same name. Actually, it’s somewhat of an issue here, because we had both a doctor and a nurse that had the same name. So it doesn’t hit us as often as it does some of the larger organizations, but it does hit us where we see a lot of father-son, senior and junior scenarios that we see issues with. That’s one area. The other one is the standardization of the data that gets exchanged. Does our lab system record data in the same way that the University of Kentucky’s lab system records data? Is it exactly the same — meaning when it goes through that transmission, do we have to convert it? Do we have to do a lot of work with it before it actually gets there and they can use it? And I use that as a minute example, but that’s part of what we at CHIME have been pointing out from the regulations standpoint — that we’ve got to get some of these standards in place so it’s easier for us as providers to share that data amongst ourselves. Gamble: Right. Now, you’ve been in your role at St. Claire for about 15 years, right? McCleese: Actually, I’ve been here for almost 21. Gamble: Okay, so quite a while. There has been such a tremendous evolution in the CIO role — I don’t have to tell you that, but how do you think that that role is going to need to continue to evolve to be able to keep up with everything that’s going on? McCleese: I think that CIOs have to be more on the strategic end. I’m talking about how do we get out there and exchange data with other healthcare providers. The CIO is going to have to be out there on the front end of that, pointing out how we’re going to have to do that. The role in itself to me has to be more on the front end rather than being reactive to some strategic decision that has been made by the organization. Because to me, the role needs to be there to the point that if there is anything being considered by the organization, whether it’s at the executive level in the organization or by the board, the CIO has some input on how that’s going to affect the entire organization. I can give you one very simple example that I’ve used here in the past. It’s very minute when it comes to overall strategy, but it’s the whole idea of how do we, in a small community like this, set up our facilities. I brought up the point a few years ago that as we develop facilities to provide different services, let’s not go get 10 facilities if we can avoid it. Let’s go get one facility out here somewhere. Because when it comes to communication, it is much more economical from the IT standpoint to provide one connection to a facility that provides 10 services, than it is to provide 10 connections to 10 facilities. And it may sound simplistic, but unless we think of those things on the front end, that’s not always the way it’s done. And in our case, we’ve consolidated facilities over the years, but for a while, we had numerous different small buildings, and of course from the IT standpoint, we had to put communications into each one of those. It’s the same thing, even when it comes to, on a larger scale, becoming part of an ACO or becoming part of a collaborative. What are the implications of this, and how do we share and exchange that data? In the case of a 10-organization collaborative, how do we share the data amongst all of us? Gamble: Right. It’s a different way of thinking. McCleese: It is. And traditionally through the years, IT has been in the support role for the corporate strategies but to me, IT has bubbled up to the top, to the point that — and I’ve said this before — it’s a strategic weapon. 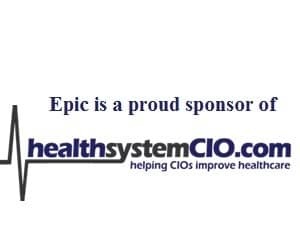 Because those organizations that do a better job of utilizing technology are the ones that, in healthcare, do a better job of taking care of the patient and do it more efficiently and more effectively. Gamble: Okay, well, that covers what I wanted to talk about. Thank you so much for your time, I appreciate it. McCleese: You’re most welcome. I appreciate the opportunity. Gamble: Sure, and I hope to see you next month. McCleese: Okay. I’ll be in Scottsdale. Gamble: Alright, sounds good. Thanks so much, Randy.